March 9, 2018. DigitalAgenda today announces the 14 winners of the 2018 Impact Awards – celebrating tech-for-good innovations that improve people’s lives and the world around us — following an exclusive unveiling in front of an audience of 300 tech-for-good innovators, investors, policymakers and academics at a ceremony at the Oval Space, in the heart of the east London tech business cluster. The Impact Awards are sponsored by Nominet Trust, the UK’s leading social tech funder, in association with Berenberg, one of Europe’s longest-established private banks. 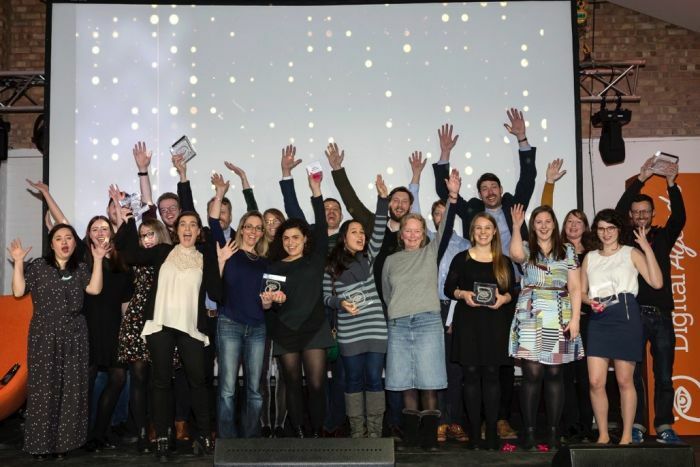 Now in their second year, the awards are open to any business, government or non-profit using digital products or services for positive social or environmental benefit. Learn My Way – learning platform built by Good Things Foundation to make getting online easy. YouTeachMe – enabling education professionals to create and use quality videos in their teaching. Code Your Future – supporting and empowering asylum seekers and refugees to become software developers. In Your Pocket, offering smartphone-enabled accessibility for people who are vision impaired. GoodGym, supporting runners to get fit by doing good. Age UK – using digital to help scale its Call in Time telephone befriending service. TalkLife: a social network providing support to young people struggling with mental health and the ups and downs of life. The Future Fox – working to accelerate the development of smart, sustainable and people-focused cities. TRIK – a mobile and web application built for insurance, engineering and construction enterprise. Green Lab – London workspace for entrepreneurs and organisations that are designing beautiful solutions to complex food, water and waste problems. Voyage Control – an air traffic control system for trucks, streamlining operations and reducing air pollution and congestion. Smart – initiatives that use connected physical devices both at home and across towns and cities, to make urban and rural living easier, offering greater mobility and enabling people to connect more easily. Little Riot – makes products that close distances and keep loved ones close. It facilitates human connection where it may not otherwise be possible. Alexandra Rose Charity, on a mission to develop the ‘Rosie’ app to create digital vouchers and automate the process of voucher reimbursement to traders. Arc-net – supporting producers and brand owners to provide access to safe and authentic produce through the distributed power of the blockchain. Apolitical – an online peer-to-peer platform for sharing ideas about public services. Unmind – a B2B mental health platform, providing clinically backed tools and training to create healthier, happier, more human organisations. AID:Tech – for-profit company with a social mission to address some the world’s largest social issues. SalaryFinance – socially responsible employee benefit that helps people become more financially healthy. Nesta Impact Investments – one of the first fund managers in the UK to launch a dedicated social impact fund. UnLtd – the leading provider of support to social entrepreneurs in the UK and offers the largest such network in the world. The Federation – an open community of digital businesses and innovators in Manchester, built on ethical values, sponsored by the Co-op Group. Yoti – a free and safe digital identity app, giving everyone a simpler, faster and safer way of proving their identity. Winner: TalkLife – (11.9% of the vote) – a social network providing support to young people struggling with mental health and the ups and downs of life. It provides an engaging, intuitive peer support platform where users can talk about how they’re feeling and connect to others. Its global platform now supports hundreds of thousands of users. The company is proud of its safeguarding, research partnerships and determination to change the way the world thinks about mental health. Go Jauntly (11.3%) – app helping people discover and share walks. Tom Steinberg – founder of mySociety – a non-profit created to build and popularise digital tools giving citizens power over institutions and decision makers. He was its director for 12 years until 2015, running websites like TheyWorkForYou.com, FixMyStreet and WhatDoTheyKnow.com. Barclays, BCS and Digital Catapult are among the newest members of DigitalAgenda’s 40-strong network. Join them to connect on tech for good and access DA events.